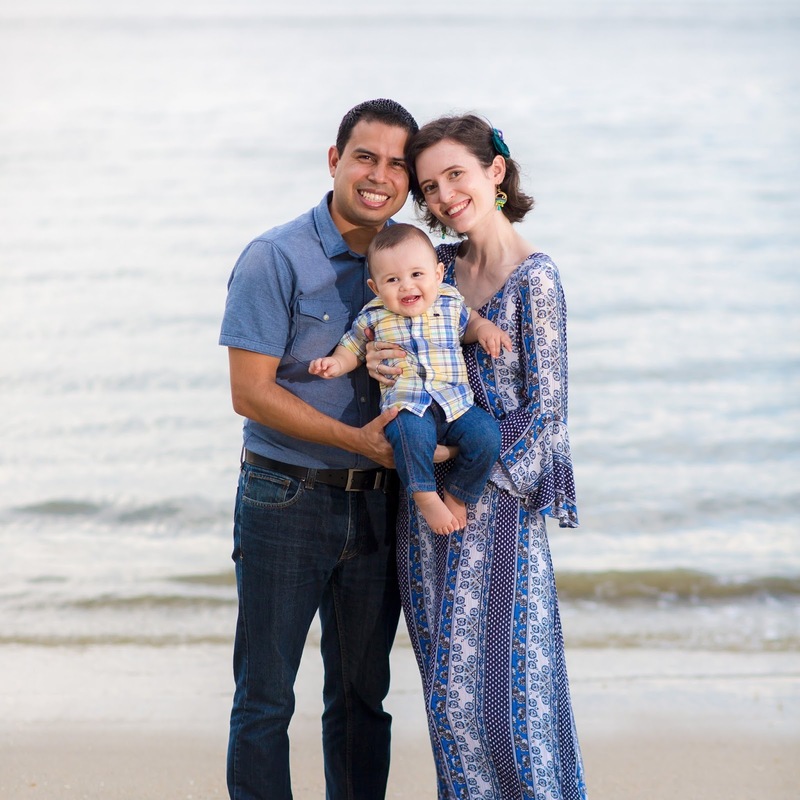 It took me only a day or two to know what I wanted as a 'memory' of my first baby. I wanted a piece of jewelry--I wear earrings for their weirdness factor (forks, safety pins, paperclips, scissors, etc), I wear necklaces for style, and I wear rings for memories--which meant it had to be a ring. May's birthstone is an emerald. I was very glad to find this out as I've always loved emeralds. I was glad the birthstone wasn't something like, say, opal or citrine. Not a fan. Sorry, October and November. 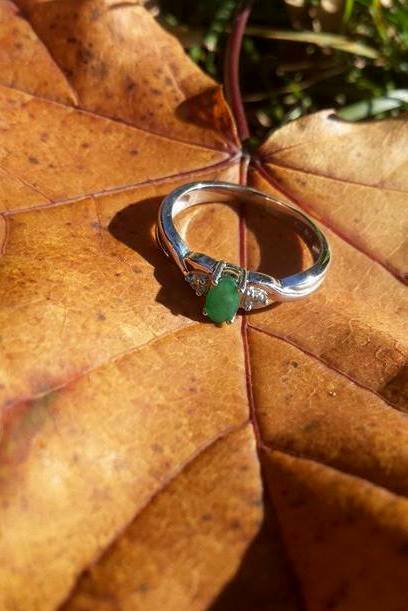 Very quickly after making the decision that I wanted an emerald ring to wear in memory, I started to realize that it wasn't the best idea. For one thing, I live in Malaysia. Here, the gem of choice is diamond. Comparatively few options exist for other gemstones in fine jewelry stores, though we visited about a dozen stores around the city. In addition, there's not much of an 'affordable fine jewelry' sort of option here, at least not for emeralds, and Angel insisted it had to be genuine emerald, not green glass. I saw chunky emerald rings that clocked in at the equivalent of $30K USD, and the one ring that was actually more of what I was looking for was equivalent to $1000 USD--and it still wasn't quite what I liked. Where's a shocked face emoji when you need one? So, I turned to my resources on the other side of the globe. I like rings and don't have thousands of dollars to spend on them, which leaves me well-aware of the options for fancy-but-not-too-fancy jewelry stores in the states. I sent my sisters on a mission to find a dainty ring in my price range that could be resized to a 4.5 (previous ring-shopping expeditions have taught me that it's not always possible to resize to that size). And they came through with a little ring from a shop in their local mall. 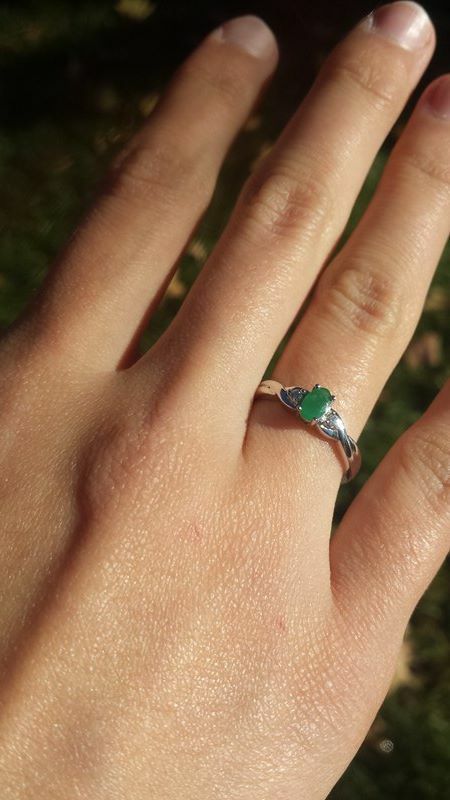 A tiny, imperfect emerald, perfect to remind me of my too-tiny but much-loved baby. The ring was on sale at a great discount, a small fraction of the prices we'd found here in Malaysia, but even so, as I got ready to send the money to my sister and approve the purchase, I was a bit overwhelmed. I don't spend that much money on myself for anything. To some extent, it seems silly to want to buy something just for me after this kind of loss. Why would I deserve an emerald ring? I didn't do anything to earn it. Shouldn't I be less selfish? Shouldn't I think of some other kind of memory thing, something cheaper and more naturally shared with Angel and others? What gave me the confidence to go ahead and buy the ring was the knowledge that this is the only money I'll ever get to spend on this baby. If she'd lived I would have had the privilege to spend so much--on her food, clothes, medicine, diapers, school books, everything. But this little ring is all I get to buy. I only wish I could have had a lifetime of spending money on her. And now comes the logistical problems. All I have is a picture of my little ring to look at, because the ring is on the other side of the world. Anna models it, because we have identical hands (no, seriously, you should see our hands and feet side by side--if it weren't for my perpetual Chaco tan, there'd be no telling the difference between feet, either). Considering Malaysia's customs department and import fees and the unreliability of international mail services that we've experienced, I'm unwilling to trust it to the post office. Maybe my sister will come for a visit next June and could carry it along with her--but that feels too late, as I don't want to face my due date without the ring, silly as that sounds. In my ideal world, my parents have a friend in Michigan who happens to be flying to Malaysia for work in the next couple months and can bring it by. It could happen. I don't know when I'll get that little ring but I'm glad I got to spend something on my first baby. That is such a beautiful ring, and such a fantastic way to keep the memories of your little baby close. I really hope that you're able to get it sooner rather than later! That is a beautiful ring (I actually have a very similar one that is garnet for my birthstone) and it the meaning behind it makes it all the more beautiful. I hope that you're able to get it on your finger as soon as possible! What a beautiful ring and beautiful sentiment! it's beautiful, and a great way to remember your loss. I have a necklace, and I love wearing it. Aw man, I love opals. But the emerald you chose is beautiful and a precious reminder. I think a bracelet would also be a good way to go. I often don't wear rings, even though I have a few. I usually tie necklaces to memories. I love the sentiment behind this piece. I hope it gets to you soon. Well I'm crying over here. And then I get to the end and realize you don't even know when you'll have it! Maybe they can mail it but hide it in a book or something? So lovely. I'm glad you found something. This is definitely something worth spending money on. So sorry for your loss, I hope the ring makes it to you soon. Oh it is gorgeous! I so hope you can get your hands on it (or get it on your hand) soon! That is such a beautiful ring - I hope you get it soon! That's such a sweet sentiment and it will be a lovely reminder of your daughter. Beautiful choice! I'm so sorry for your loss. What a beautiful idea! Wearing it is like always having a piece of her with you. Sentimental pieces are the best pieces. Although I'm sorry to hear the story behind it, it's still such a beautiful gesture (much like the ring). That's a gorgeous ring, and the sentiment behind it is beautiful. Makes perfect sense to me, everything you said. I have a brooch for my cousin, and one for my Dad, and for my granny. But I never normally wear brooches... So I have no idea what that's all about. I love that you have an identical hand twin sister, and I'm throwing my hat in the ring here as another one for Team Opal. My engagement ring is opal although turns out it's not very sturdy so I can't wear it at the moment because I cracked it... Oops. Oh wow, I hope you are able to have it by the time your due date would have arrived. That day will be hard no matter what, but having that ring on your finger would surely bring a little sweetness to the bitterness of the day. This is a beautiful idea and such a precious way to remember your precious little one. This is just the sweetest thing. You'll never regret buying that ring. Perfection. The ring is beautiful and now when someone asks about it you get to talk about your sweet baby and honor her memory. She's as real as the ring on your finger (or Anna's finger, as it were.) I still think having a physical memory would have helped me emotionally put myself back together after my miscarriages. The ring is beautiful. What a meaningful way to remember. I'm so glad you were able to get that memory ring, and hope it gets to you before the crucial date. You were right about it being an acceptable use of the money since it is all you will get to spend on your precious girl. I trust that your healing process is progressing and that you both are finding the comforts of God when you need them most. What a beautiful commemorative choice. You're not selfish at all.